Early `80s Tokai Silver Star Strat type in absolute near mint condition. 1 piece neck, grey bobbin pickups ,all the good specs. Amazing looking `70s type Sunburst finish. 3 bolt tilt neck that actually works as it was designed to! 2004 Rickenbacker Model 360 in near perfect condition. All original including RARE factory toaster pickups. A couple of very minor low-points on lower frets. Quite possibly the cleanest & best looking Rickenbacker 360-6 C63 for sale in the world right now. Ultra clean, I can not find a mark on it. Always a firm favorite in this family, the RIC 360/12 captures the sound and look of one of modern music's greatest periods like no other guitar. But it sure has been a while since we had one drop by! Custom Colour 2012 Rickenbacker U.S.A. Model 330 . Looks stunning in factory Ruby Red. Plays and sounds as good as it looks, chime for days! Super low action that Rics are renowned for, not buzzes or dead-spots up & down the whole 2 octave neck. Rickenbacker USA Model 360 Fireglo with orig RIC ABS case.Beautiful version of Fireglo finish. Super lightweight & very resonant version of the deluxe RIC 6 string model outside of the reissue series. Other ~SOLD~Bacchus by Headway Japan "Blackie" replica. 1989 production Orville by Gibson Les Paul Standard. Solid 8.5 / 10 condition. Signs of general player wear, but no breaks or major scratches etc. G serial #. Original HBR Gibson USA pickup in the bridge, Seymour Duncan SH-1n in the neck. A really well balanced combination. A true ROCK MACHINE, from tip to tail. Great solid build (weighs more that a new \"chambered\" Les Paul Standard!! ), beautiful full neck & 1 x P90. Try it next to a new Tribute Junior etc & try & convince yourself USA guitars are still the best!! 2012 Nash T-52 with Lollar pickups. As traded, as "new" . 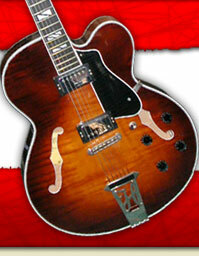 Made in Korea De Armond Jet Star from the days of Fender's ownership of the brand. In great condition for age, with amazing sounding pickups. Of course, in black! Comes with Fender branded hardcase. Top of the Line, King of the Cowboys Gretsch "solidbody" from the pre Fender Era. Solid 9/10 condition, no one buys one of these & doesn't look after it! Comes with original Japan market olive green hardcase.